Is This Cat Attacking A Plate Of Musical Peas? 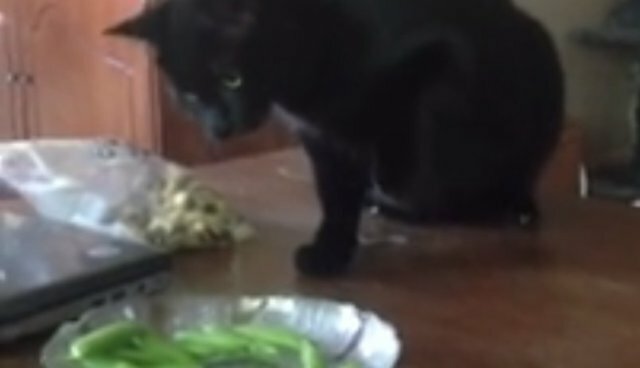 A video of a cat smacking a plate of peas while its owner plays guitar, originally posted in June, was picked up by Reddit this week promptly went viral (Update: It's topped 500,000 views). "Cat Thinks A Plate Of Peas Is Making Music," reads the Huffington Post headline. We've seen this behavior before--the famous Cat vs. Printer video also shows a cat smacking a foreign object with its paw, claw retracted. It's behavior that seems odd; the cat doesn't seem angry, so why is it punching an object? We called up Beth Adelman, a Brooklyn-based cat behavior specialist, author and former writer of a New York Post column about cat behavior, to find out what's going on. "The cat knows the music is not coming from the peas," she says. "Cats are really efficient at discriminating between the source of sounds." In fact, they're much better at this than we are. A cat's pinnae, the satellite-dish shaped outer ear that we often think of as just "the ear," can move independently to help it pinpoint sounds. A cat can, says Adelman, "discriminate between two sounds that are emanating from sources only three inches apart." The cat knows the music isn't coming from the peas, in other words. But that doesn't mean the cat fully understands what's happening. "The cat is hearing the music concurrently with touching the peas," says Adelman. "So that's kind of freaky and probably very confusing for the cat." Adelman cites the cat's ambivalent body language: tail down, but not between legs; a cautious approach, low to the ground (or table, in this case); and, surprisingly, the method of attack. Everything about this cat's behavior says, I don't know what's happening, but I'd like to find out. And nothing about its behavior suggests aggression. The quick pokes from the cat's paw are not actually not an attack. "When cats touch [foreign] objects, they don't know whether they're alive or dead, or whether they'll bite them, or whatever, they often just tap them to see what happens," says Adelman. "It's like an experiment." It's the same strategy we ourselves use to test, for example, an object's temperature. If you take a pan out of the oven and aren't sure if it's too hot to handle, you might give it as quick a touch as possible. "If you just touch it for a nanosecond, if it burns, if it's hot, if it's prickly, you've barely touched it," says Adelman. "You haven't exposed yourself to much." That's why the claws aren't out. The cat doesn't know if it wants to attack this weird pea-with-inexplicably-associated-music item. So it uses the pads of its paws, which, according to studies like this one, are incredibly sensitive. The cat's paws can tell it temperature, texture, movement and all kinds of other information, just like our own hands. It only looks aggressive.